I had pain in the evening because the sole was wearing stiff safety shoes, so I bought it in the evening, so I could easily cut it with a normal pair of scissors. I feel a little tired of my feet and I feel relieved. This review is about item#35775196. My legs are less tired. I do not know the durability yet. I look forward to it. This review is about item#35775187. I use it for a sneaker with a bigger sense of size. It is perfect size and it is a good feeling without deviation. I will use it as a shoe insole to use for patrol on foot. First I felt the hardness and I got no sense of incompatibility while using it.I feel like walking with legs fixed in the shoes. We purchase on-site work items directly from Midori Safety, but since this item can be purchased cheaper more, it is saved. Although I do not know the durability system because it is cheap, I bought three with comfortable feeling. 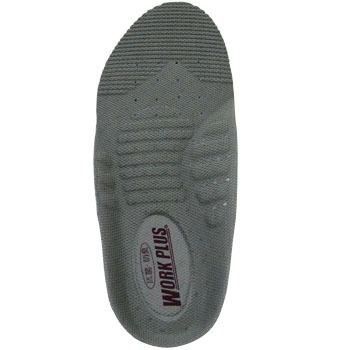 I tried purchasing it for comfort improvement of safety shoes which became a little big by becoming familiar too much. I felt like I was able to reduce the fatigue and pain of my feet because the foot feeling was also good and the fit feeling improved. It is used for shoes whose inside is not shaped along the foot, similar imported items (made in China) will collapse soon, but it will be useless, but Midori security is a wonder. I use it as an underlay for Midori safety shoes. It was cheaper than purchasing at home center so we purchased several pieces and used it.